Timeless beauty, stylish appeal, and affordable prices: You can have it all with hardwood flooring. Our company makes it easy for you to add classy charm to your home. By offering affordable wood flooring products in all varieties, we give homeowners a feasible way to be creative with their floors. Hardwood floors are also excellent choices for business owners. They make a lasting first impression on customers and clients. There’s nothing quite like the look of hardwoods, whether you opt for engineered, solid, or handscraped flooring. It not only accents your interior décor, but it can change the overall feel of your entire room. In addition, wood is practically ageless. It lasts a lifetime, and can be sanded and re-finished if necessary. Most importantly, it is more affordable than you make think. Since we are backed by the buying power of Flooring America, we pass our savings on to you in the form of unbeatable low prices on brand-name hardwood flooring. Boost your home’s property value by installing engineered hardwood floors from one of our recommended brands. Engineered planks are constructed from multiple layers of wood, which are bonded together under intense heat and pressure. Since the planks are combined in layers, they do not expand and contract due to humidity like solid planks tend to. They are ideal for areas that are subject to moisture, such as the kitchen, bathroom, or basement. These floors are also better suited for properties with in-floor heating systems. Engineered hardwood is also a great option for budget-conscious shoppers. While the top layer is always attractive genuine wood, the bottom layers are typically composed of durable and affordable plywood or high-density fiberboard. This allows you to achieve the same design as real wood without breaking your budget. Learn more about the benefits of this flooring by visiting our store and talking with our staff members. To lay down a firm foundation for your home, it is important to begin with integrity. When you want to add character to your property, install solid hardwood floors from our store. These planks are made from real wood from top to bottom and are milled from a single piece of lumber. It is permanently nailed to your subfloor and thicker than many other wood floor varieties. This means it can be sanded and refinished several times, extending its already long lifetime. Solid hardwood is a great investment for anyone who wants to add enduring beauty to their property. If you prefer the traditional look and feel of real wood under your feet, head into our store and browse our immense selection of genuine wood flooring. Add texture to your interior design with handscraped hardwood floors. 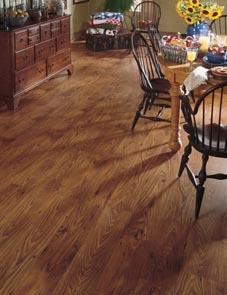 This style of distressed wood flooring is becoming more and more popular in homes and businesses throughout the nation. Each board is individually scraped to bring out the wood’s unique graining and create a rustic aesthetic. Choose this stunning flooring to express your specific aesthetic preferences. Trust our experienced and skilled hardwood installation team to install your new hardwood floors. You can depend on our flooring technicians for professional hardwood flooring installation. We not only sell a wide range of home improvement products, but we also provide comprehensive installation services by certified technicians. Our installers are fully trained to work with all of the products we sell. In addition, we guarantee that you’ll be happy with our work and back up that promise with our Ultimate Confidence Guarantee. Under our Ultimate Confidence Guarantee, your satisfaction is ensured. If you find any fault with your product or hardwood flooring installation work, we will replace it with a new floor of comparable value at no cost to you—no questions asked. We are known for our industry-leading guarantees, so you can be completely confident about our products and services. Some people think that buying unfinished hardwood floors saves them money, but this is a misconception. Once you factor in the costs of sanding, staining, and applying polyurethane, you may end up paying more than you bargained for. You also end up putting in a lot of unnecessary time, labor, and stress. Make your life easier by depending on us for prefinished hardwood flooring. Simply choose the exact hardwood floor you want from our diverse stock and we’ll deliver it to your home and install it for you. Contact our home improvement store to learn more about our extensive stock of hardwood flooring prices. We proudly serve the communities of Bedford, Manchester, Hooksett, Concord, Hollis, Merrimack, Goffstown, Amherst, Nashua, Windham, and Londonderry, New Hampshire.